So what should you look for when buying a German Shepherd? The pedigree of a dog tells its own story. Who were the parents? Did they win awards? Pass physical tests? And, what does that mean? Well, German breeders evaluate the whole dog; its character, intelligence, performance ability and physical structure. They do this by training their dogs in Schutzhund trials and Sieger shows. 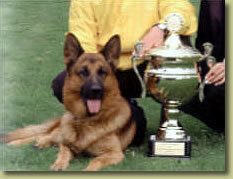 Schutzhund Trained Dog trials are the most mentally and physically demanding of all performance events. Schutzhund trials combine three types of events: tracking, obedience, and protection.Schutzhund titles are awarded at three levels of increasing difficulty. SchH.I, SchH.II, and SchH.III. In Germany, a dog must pass all three levels before they are 3 1/2 years old in order to be considered as a breeding animal. Schutzhund training certification is done in a single day. The Schutzhund German Shepherds must be able to track a scent, perform off leash commands, scale a 6 foot wall and perform defense work. They are also required to gait for 9 miles at about 6 miles per hour! These dogs become the best in obedience, temperament, protection, courage, and confidence. We have selected dogs that are IPO/ Schutzhund trained because it has been proven to result in a sounder, more accurate breed. Breed ratings such as VA & V can only be awarded at a Sieger Show. The dogs entered have to be at least 24 months old. They are required to be schutzhund titled, koerklassed, and have the German “a” stamp for their hips. Sieger ( Champion ) shows are a three day event. The first day the dogs must pass the schutzhund trials, if they do not they will not be allowed to go any further. The second day, the dogs are inspected by a German Judge and Koermeister, this is very extensive, and everything is checked: the movement, obedience, temperament and even the counting of the teeth. Again, if they pass, they can go forward to the third day. This day the dog gets to compete in the show ring. At this point the dogs will have to gait around the ring for hours while the judges watch their movement and stamina. Only the healthiest dogs with correct structure can pull on a lead for this amount of time. The Judges position dogs during this phase so that the best, are in the front until they are satisfied with the order of the dogs. In addition to all of this, they will shoot a blank pistol over the top of the dogs to test for courage. After all of this, only a small percentage of the dog’s that made it to the 3rd day of the show will receive the V rating. VA rating is only awarded at the annual Sieger show by competing against the top V rated dogs. VA is the highest rating a dog can acquire from the German judges. Internationally schutzhund has been changed to IPO, IPO stands for International protection Ordinance. Because some countries were using schutzhund and some IPO the German SV changed schutzhund to IPO so that it is now the same in all countries. Only off spring bred from dogs that have acquired the LBZ can qualify to go VA themselves. Hip Certification: Germany uses the “a” stamp, The USA uses the OFA. 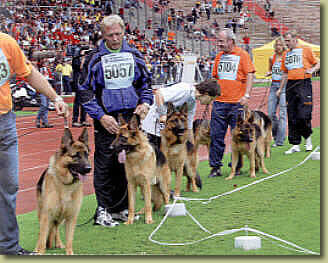 The North American and USA sieger shows, often have more than 500 German Shepherds entered from over 20 different countries. Over 130 German Shepherds were entered from Germany alone! These are some of the top breeders/kennels from all over the world. Our German Shepherds are of world-class West German bloodlines. Our dogs are bred for steady predictable temperament as well as the noble beauty and intelligence of the breed. They are the complete dog, perfect for family and personal companionship. They have impeccable pedigrees, combining top show and working bloodlines. Our shepherds are protective, dependable and loyal. We are one of the Top 10 ( Ten ) Breeders in the USA. We are a Professional German Shepherd Breeder, breeding to the highest of Standards. 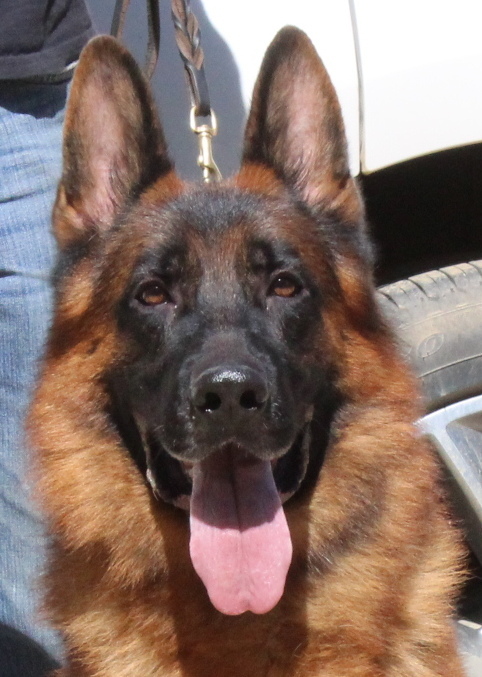 We are a reputable German Shepherd Breeder here in the US and Europe, producing World Class German Shepherds. Many of our German Shepherd puppies have become German Shepherd Police dogs. All Kolenda Kennels breeding dogs have x-rayed and certified hip’s, DNA Tested, and A.K.C. Registered. Kolenda Kennels is a member of GSDCA (German Shepherd Dog Club of America) & United Schutzhund Clubs of America , The American Kennel Club. All Puppies have a written guarantee.